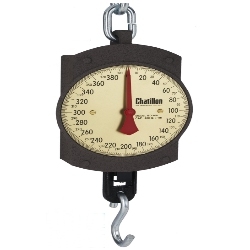 The CHATILLON BD Series hanging scales are designed for weighing large or small loads up to 400 lbs. Ideal for agriculture, warehouses, workshops or the home. Scales are constructed with a heavy, protective cast-iron runner and housing with large, easy-to-read 7-inch dial. Large, bold black numbers and graduations. Scales feature a convenient zero adjustment screw. Scale is factory calibrated using certified NIST weights. The CHATILLON® BD Series hanging scales are designed for weighing large or small loads up to 400 lbs. Ideal for agriculture, warehouses, workshops or the home. The BD Series Hanging Scales are constructed with a heavy, protective cast-iron runner and housing with large, easy-to-read 7 inch dial. The dial has large, bold black numbers and graduations. These affordable mechanical hanging scales, available from Central Carolina Scale in Sanford, NC achieve full capacity in just one revolution. Best of all the scales feature a convenient zero adjustment screw. The BD Series hanging scale is factory calibrated using certified NIST weights. The BD scale comes with plated top loop and bottom hook.